Gameplay screenshot of Boat Yoshi. Boat Yoshi is a transformation seen in the game Yoshi Topsy-Turvy. It is encountered twice during the Tale of the Spirit of Fright. This transformation is very similar to the Ship Yoshi form, being a little faster. He can float above the water and continually move forward. This form has a paddle-steamer design, with two wooden wheels which turn and allow Yoshi to move. 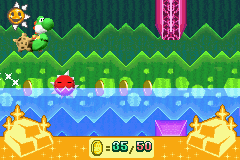 Yoshi can jump using , and the player can change water level by tilting the console to the left or the right. Obstacles such as Igashira-kuns and walls are found along the route Yoshi takes. If he is held back by an obstacle and goes off screen, he will lose a life. This page was last edited on November 18, 2017, at 18:11.